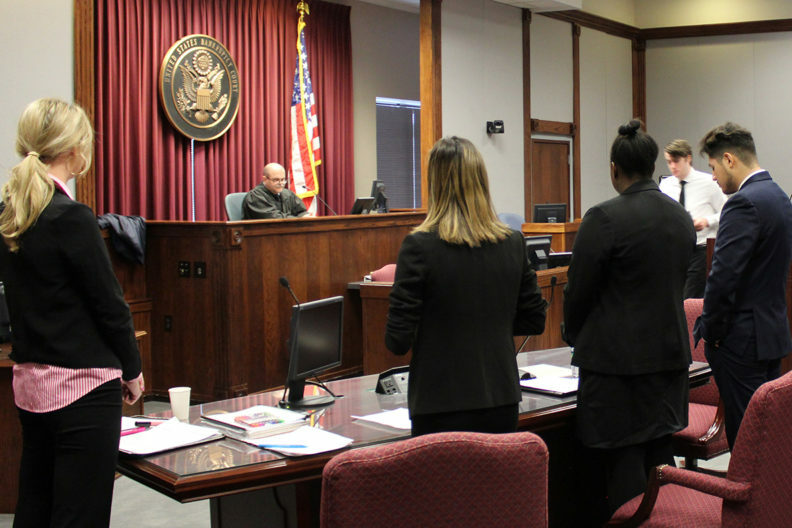 Adding powerful authenticity to their experience, this year’s Mock Trial team recently got the rare opportunity to practice their skills in an authentic courtroom and to meet with real‑life judges, lawyers and other legal professionals where they work. 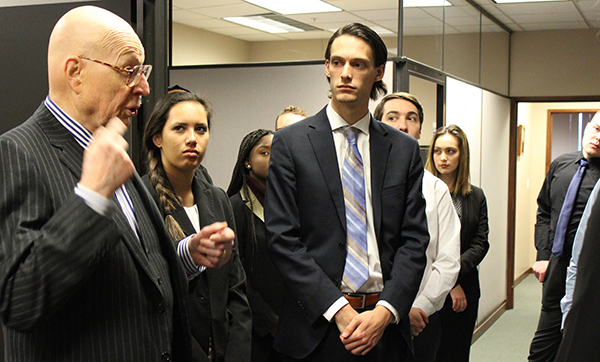 A generous gift from WSU alumnus Judge John Rossmeissl, of the U.S. Bankruptcy Court for Washington’s Eastern District, made it possible for 22 students in Aman McLeod’s “Political Science Issues” class to travel to Yakima to participate in two practice trials and to learn first‑hand about courthouse operations and procedures. Seattle attorney and WSU alumnus Tim Filer also donated his time to act as judge for one of the three‑hour trials. 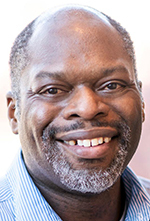 He listened to the students’ case arguments, ruled on their evidence and adherence to procedures, and even threw them a few curveballs “to make it seem more real,” he told the students afterward. Filer provided constructive feedback about their lawyerly performances and answered the students’ questions about both real and hypothetical situations as well. Also a lawyer, McLeod has been working with the students since early in the fall semester to prepare them for the American Mock Trial Association’s (AMTA) regional competition Feb. 9‑10 in Seattle. Winners will advance to the semi‑finals leading up to the national contest this spring in Washington, D.C. Rehearsing case presentations in a real courtroom with a practicing attorney as judge was a “valuable experience that allowed me to better understand the role and duties of an attorney,” said Isaac Castaneda, a senior majoring in political science. “Participating in Mock Trial at WSU has further motivated me to attend law school,” he said. “Mock Trial helps students learn about the legal process by assisting them in developing a case strategy, designing questions for cross examination and learning and identifying rules of evidence,” said Kristi Denney, director of the Pre‑Law Resource Center at WSU and an attorney as well. “The program helps students develop analytical and communication skills, gain experience and confidence in public speaking and obtain deeper understanding of the justice system—valuable skills for all students, not just future attorneys,” Denney said. In Yakima, the students also got a firsthand, behind‑the‑scenes look at a courthouse’s inner workings and met with several WSU alumni who are successfully employed in the legal professions. Rossmeissl, who earned his bachelor of arts degree at WSU in 1962 and his juris doctorate at the University of Chicago Law School in 1965, made a gift to the College of Arts and Sciences that paid for the students’ travel to Yakima and their lodging and meals while there. Mock trial is a combination of legal trial practice and theater. Members represent a wide diversity of majors. Founded in 2003, the WSU Mock Trial team quickly established itself in regional competitions as a worthy contender, earning the right to compete at national championship tournaments virtually every year since 2006. The AMTA‑provided case problem is a particular scenario running well over a hundred pages that lays out a factual event culminating in a court trial. Participating teams develop a case theory and strategy, build characters from the available witnesses and present the best possible case and argument. The students must master specific roles as either witnesses or attorneys and for both sides. Their performances are scored by real judges who preside over the trials and determine the winner. The PLRC supports the WSU Mock Trial team and other students in any major who are interested in careers in law by offering advising, scholarships, mentoring, guest speakers, internships, alumni networking and more. Other groups that provide funding and support for the Mock Trial program include the College of Arts and Sciences and the departments of Politics, Philosophy, and Public Affairs and History. Gifts to support Mock Trial and the Pre‑Law Resource Center Excellence Fund can be made securely online or by contacting the CAS development office.